Scanpan Professional Cookware is designed for connoisseurs in need of kitchenware beyond the ordinary. Scanpan Professional is hand-crafted, squeeze-cast in evironmentally-friendly, recycled aluminum . Old artisan cast techniques are combned with tody's latest technology to create ccookware in a class ll its own. Scanpan Professional Cookware features clean, elegant lines. The stainless steel covers and handles are polished in a two-tone matt-and-mirror finish, setting an exciting visual contrast to the all black pan body. Scanpan Professional is made from a core of solid squeeze-cast aluminum, forged into shape with 200 tons of pressure. The optimum thickness of the pan base prevents warping and keeps the pan base perfectly flat, especially important when used with glass top or ceramic ranges. The patented nonstick surface is created by firing a ceramic-titanium particles into the pan and a specially formulated nonstick compound is embedded in the ceramic-titanium surface. Scanpan Professional is safe to use with metal utensils and comes with a Lifetime Warranty. Made in Denmark. Scanpan Green Tek non-stick surface is PFOA-free in all stages of the manufacturing process. 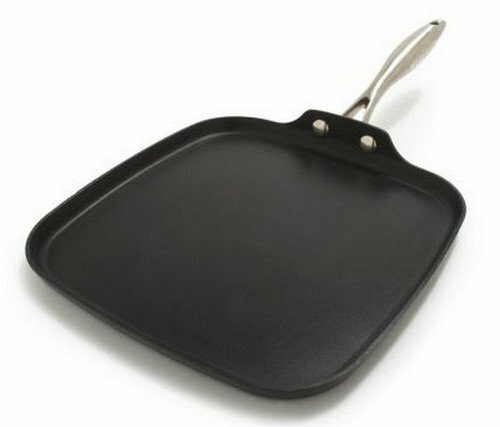 Scanpan green tek non-stick surface is pfoa-free in all stages of the manufacturing process.